Why Are Hotel Beds So Comfortable? Home Blog Why Are Hotel Beds So Comfortable? 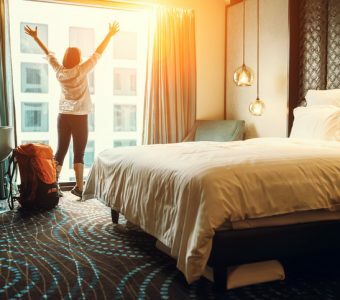 Hotels know that the top priority of exhausted travelers is getting a good night’s sleep, which is why high-end hotels spare no expense when purchasing beds and bedding. If you long for the hotel bed experience, but would rather not live at the Marriott, head over to Mattress World Northwest. Our showrooms in the Portland area have everything you need to recreate the feeling of waking up refreshed and energized at a luxurious hotel. Hotels didn’t always put so much emphasis on the sleep needs of their guests. The pioneer in this area was Westin Hotels & Resorts. In 1999, hotel management took a close look at a survey of travelers. It informed them that what travelers want most out of a hotel is a good night’s sleep. The end result? Westin spent $50 million to research the perfect bed and outfit their rooms with it. Over a year was spent in meticulous market research. The company pushed 50 beds into a hotel ballroom. The beds were purchased from 35 different hotel chains, as well as some boutique establishments. The researchers then had the enviable job of lying around all day to figure out which bed was best. After snoozing on hundreds of mattresses, Westin researchers developed their very own Heavenly Bed. The Heavenly Bed is a thing of beauty, with a custom-made pillow top mattress, 250-thread count sheets, plush pillows, and down duvets. One of the signatures of the Heavenly Bed is the color scheme—all white. Westin researchers determined that white sheets, pillowcases, and duvets created a “halo effect” that triggered the feeling of serenity. It also makes the hotel room look recently renovated. Does the type of mattress matter? Although Westin, and many other upscale hotel chains, use pillow top mattresses, this doesn’t necessarily mean that a pillow top is the right choice for you. Some hotel chains find that their guests tend to prefer memory foam or a medium firm inner spring. Each type of bed has its own unique advantages. The trick to getting the perfect night’s sleep is to try out numerous types to find the right one for you. Once you’ve found the best mattress type, firmness level, and size for your bedroom, it’s time to dress it up with hotel-style bedding. Experts recommend five pillows for the hotel experience. Heavenly Beds follow this rule, with two down-and-feather pillows, two down alternative pillows, and one boudoir pillow. Choose white sheets with a high thread count—at least 250 or 300. Westin actually uses three sheets for the Heavenly Bed—a flat sheet, middle sheet, and fitted sheet. Top your masterpiece with a white, plush duvet, and get ready to snooze like it’s going out of style. The Sleep Specialists at Mattress World Northwest in Portland want to help you build the perfect sleep experience for your needs. We encourage you to try our wide selection of memory foam, latex, inner spring, pillow top, Euro top, and hybrid mattresses to find the right choice for you.